Talukder Abdul Khaleq, newly elected mayor of Khulna City Corporation (KCC), called on Prime Minister Sheikh Hasina at Ganabhaban on Sunday. The Prime Minister greeted the mayor as he presented a bouquet of flowers to her. 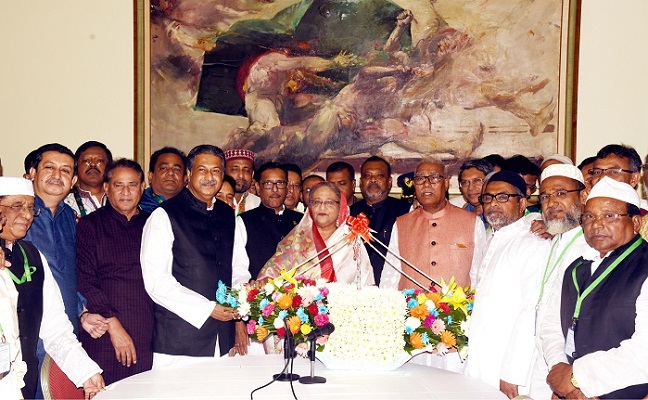 General Secretary of Awami League Obaidul Quader, Sheikh Helal, MP, and central and Khulna leaders of the party were present. The Prime Minister thanked party leaders and workers for working together to ensure victory of the party candidate in KCC poll. "The KCC poll indicates that winning any election is possible if the leaders and workers work together," she said. The prime minister said the Election Commission (EC) is performing its duties with complete freedom. The EC is even barring the ministers from taking part in the election campaign which is rare in many democracies, she said.